My shiny ghost scarf is to die for! Hello my friends! It’s been a while since I’ve updated this blog. Sorry about that. I’ve been busy traveling the world, going places no dog has gone, and taking long walks on the beach. Oh wait, I didn’t do any of those. Mom did. All I did was stay in the dog hotel and wait for her. On my last day at the dog hotel, they emptied out my room and I knew right then and there that it was time to go home! I was so excited that the kennel employee had a hard time putting on my harness! I was too jittery excited! Mom doesn’t deserve all this excitement! She’s had enough! Fun time for me! 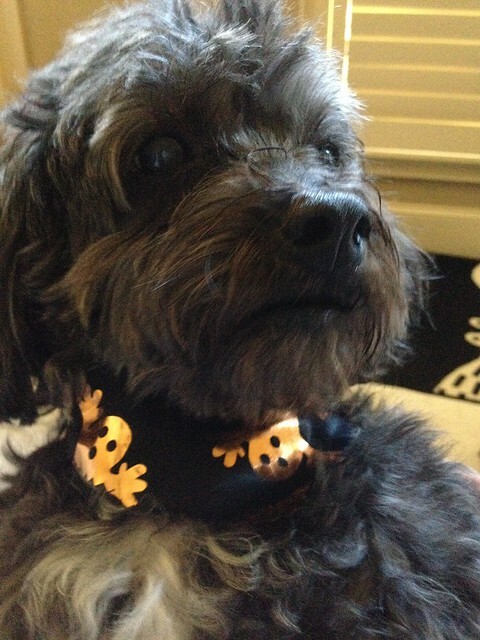 I hope there are a lot of trick or treaters tonight so I can bark and scare them with my ferocious growl. Grrr, baby!